Driving around in my neighbourhood, I am reminded of a scene in an African movie with a Nigerian setting. The roads are potholed and muddy, with patches of what used to be tarmac, but now just rough patches, bad for my tyres. This is the fourth time in a year that I have had to have the suspension of my car redone. The situation is terrible and this is part of the legacy that Robert Mugabe has left behind. As I watched these Nigerian African movies, I figured that unprecedented corruption was the culprit in a country with vast oil reserves. Similar corruption flourished in Zimbabwe under Mugabe. Beautiful houses, almost palatial, linked to bad road infrastructure had become the phenomenon. The gap between the upper class and the lower class widened, totally obliterating the middle class. Little did I know that Zimbabwe would get to this stage, but it did under Robert Mugabe, his selfish wife Grace, and their G40 cabal. When one looks at the real picture, it boggles the mind how the former President can envisage setting up a new party that would garner support from the long-suffering masses. The fact that he believes it proves that his mental capacity is past its best-before-date. His mental faculties are not renewing as fast as they used to, otherwise he would interrogate the hogwash that is being massaged on his brain by his selfish wife Grace and dismiss the formation of a party with the contempt it deserves. Who in their normal faculties after suffering for so long would want to go back to that kind of life? Just a reminder, life under Mugabe rule was characterised by deteriorating hospital facilities. He did not care to improve because the State used the taxpayers' money to fly him to Singapore, Malaysia and China to get professional health care. Price hikes, police corruption, queuing for long hours at the banks just to access US$20 when he had up to US$20 000 hard currency delivered to his door step each month, poor sanitary services, no running water on the taps and potholed roads while he made sure the road that led to his house was tarred regularly. 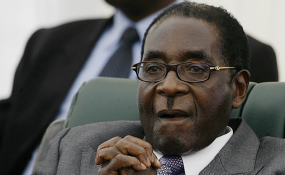 Mugabe has decided to set up a party labouring under the assumption that he has the rural vote. How gullible does he think Zimbabweans are? The people in rural Zimbabwe are linked to their children in the urban areas. Their voting behaviour is shaped by their children and benefactors in the urban areas. If I was unemployed during Mugabe rule and struggled to get my parents the basic necessities of life, and to get them proper health care, now that I am employed under President ED Mnangagwa's rule, I will tell my parents and dependents to put their X where credit is due. A close analysis of the characters in this lunatic party, NPF, include such characters as Saviour Kasukuwere, a very corrupt individual who built a 50-bedroomed house with bullet-proof windows on the salary of a civil servant. A land baron, the promotion and mushrooming of land barons increased under his watch. During his stint as Minister of Youth, Indigenisation and Economic Empowerment, he misappropriated the CABS loan facility meant for youth empowerment programmes, and failed to explain why the Community Share Ownership Scheme failed to produce tangible financial results, or even to benefit people of communities such as Marange. Jonathan Moyo is equally of shady character. He swindled US$6 million from Ford Foundation in Kenya that he had been entrusted with. Back home, he embezzled money meant for students from ZIMDEF and used it for his own personal campaign in his constituency in Tsholotsho where he bought bicycles supposedly meant for chiefs. These men engaged in disgusting corruption with the backing of Grace Mugabe, the Queen of corruption. Ambrose Mutinhiri is a polygamist and wife beater. Using the fact that he is Mugabe's cousin as his trump card to politics, the butcher of Marondera East Constituency has been nominated to be the president of the sorry party. His character leaves a lot to be desired, having been married to Tracy Mutinhiri who suffered massive marital abuses, both emotionally and physically. She was denied her conjugal rights while Ambrose gave her love to another woman. As for Grace and her little rascals, I would need a whole book to chronicle their corrupt activities. She is a sad story of greed and selfishness.